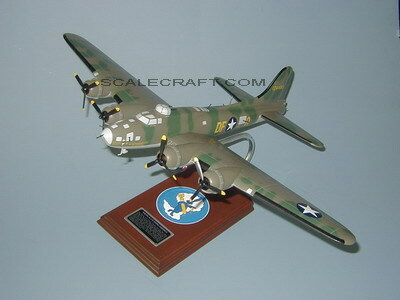 The B-17 Flying Fortress "MEMPHIS BELLE" (Serial No. 41-24485) was one of 12,750 B-17's built by the Boeing Aircraft Co. The BELLE was the most famous because she was the first heavy bomber in Hitler's European war theatre to complete 25 combat missions and keep her entire crew alive. She flew for 10 months from November 7, 1942 to May 17, 1943. The command generals had set 25 missions as an incentive for air crews to go home. Morale was extremely low because 80% of the bombers were shot down during the first three months of America's combat flights over Europe. The BELLE shot down eight enemy fighters, probably destroyed five others, and damaged at least a dozen more. She dropped more than 60 tons of bombs over Germany, France and Belgium. During her 25 missions she flew 148 hours, 50 minutes, and covered more than 20,000 combat miles. She is the only B-17 to have her own file in the Air Force Film Depository. Mahogany Wood. Scale: 1/62. Wingspan 20 inches, Length 14 1/2 inches.